Queen’s University has been awarded a grant of £50,000 as part of Santander Universities Enterprise and Entrepreneurship Fund. The University is one of just 15 institutions across the UK to receive a grant from the Fund, which was launched to celebrate Santander Universities’ 10th anniversary in the UK. The University’s successful bid, led by the Enterprise Department of the Students’ Union and The Graduate School, will facilitate the delivery of a range of projects across campus in the next academic year. This will include a Festival of Entrepreneurship, featuring inspirational speakers and activities designed to help students generate new business ideas. The grant will also help support a schools’ programme, with University staff and students providing mentoring for primary and secondary pupils to encourage their entrepreneurial ambitions. Matt Hutnell, Director at Santander Universities, commented: “We very pleased to award this grant to Queen’s University Belfast, which will support a range of projects aimed at inspiring students and encouraging budding entrepreneurs both at the university and at local schools, including the Festival of Entrepreneurship. Speaking about the award Professor James McElnay, Acting Vice-Chancellor and President at Queen’s University, said: “Northern Ireland has the highest proportion of people in the UK who believe that self-employment carries a high status but the lowest rate of people who believe they have the skills, knowledge and experience to make it as an entrepreneur. 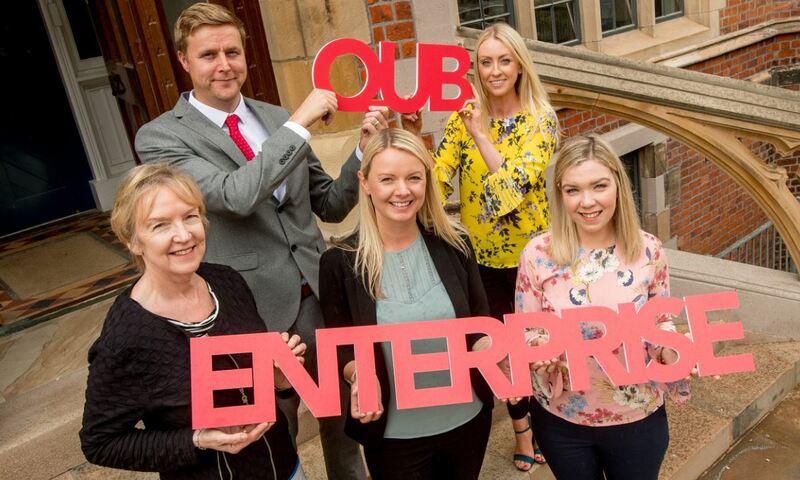 Kat Maguire from Enterprise SU commented: “Enterprise SU exists to provide Queen’s students with the skills and knowledge to run a business. The Graduate School furthers this offering to postgraduate students. “We are delighted that the University has secured £50,000 and the funding will enable us to help students launch viable businesses, as well as supporting those who would not have previously considered entrepreneurship, to ‘give it a go’. Delivery will commence in July with an accelerator programme for student businesses, followed by an international ‘best practice’ trip to Silicon Valley and Stanford University for students and staff. Joanne Graham from The Graduate School said: “The funding received from Santander will enable us to further enhance the collaborative entrepreneurial support we offer at Queen’s. “In addition, we are planning to create an Enterprise Pod which we will take around the University to bring enterprise directly to the students, providing opportunities to avail of enterprise support within their faculties,” she added. Queen’s University became a Santander University in May 2008 and is now part of a network of over 1,200 universities in 20 countries across the world, including Spain, Portugal, Latin America and the UK. Santander funding supports scholarships and mobility awards for students and staff, entrepreneurship activities, internship funding as well as leadership and skills development for students. Santander Universities Enterprise and Entrepreneurship Fund is a £1 million fund designed to support universities in delivering large-scale projects benefiting over 5,000 people directly and driving economic benefits across the UK. The key objectives of the fund include helping to start, run or grow a business, developing and promoting entrepreneurial skills, culture and mind-sets, championing innovation within businesses and delivering economic, social or employment benefits to the local and national economies. For details on Enterprise SU contact Kat Maguire, Enterprise & Development Support Officer, Students' Union, telephone: +44 (0)28 9097 1056. For more information on Santander Universities please click here. Santander media enquiries should be addressed to Leonora Burtenshaw, telephone: +44 (0)20 7756 4543 or 07701 004 107 (m). The Santander Press Office operates from 8am to 6pm; outside these hours please call 0800 5877708. Queen’s University Belfast media enquiries to Gerry Power, Communications Officer, Development and Alumni Relations Office at Queen’s University; tel: +44 (0)28 9097 5321. Photo caption: (Back row) L-R: Graeme Elliott, University Relationship Manager, Santander and Joanne Graham, Postgraduate Employability & Enterprise Manager, The Graduate School; (front row L-R): Norma Sinte, Director of Development and Alumni Relations; Kat Maguire, Enterprise & Development Officer, Students' Union and Claire Harris, Postgraduate Enterprise & Community Officer.